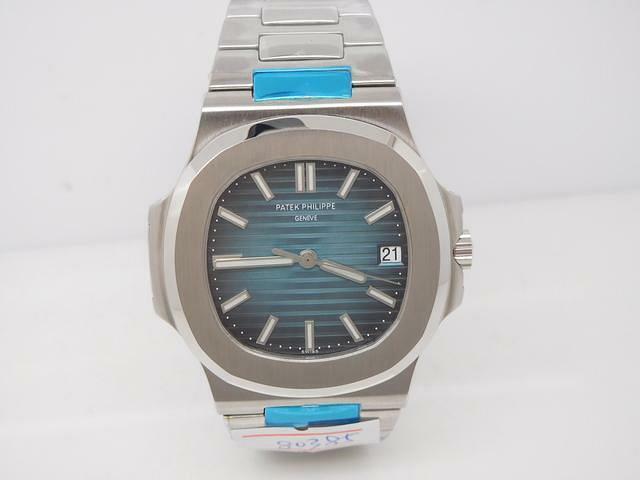 Nautilus is one of eight series of Patek Philippe, it is the earliest sports model Patek Philippe designed. Nautilus series was created in the 1970s, inspired by porthole, using the submarine Nautilus’s name, to pay tribute to the never-ending exploring and challenging spirit. In 1976, Patek Philippe published their first Nautilus model Ref. 3700. Today I will bring you guys a review of replica Patek Philippe Nautilus, the watch is from BP factory. Actually, there are already other two factories manufacturing Nautilus replica, one is V6, the other is MK. Although MK factory modified the movement plates to the outlook of Cal.324, its movement is not as stable as BP’s Miyota 9015. Now, many buyers who own Patek Philippe Nautilus replica had admitted that the one from BP factory is the best, the grade belongs to A+++. Not only the movement from BP factory is more stable, the price is also much cheaper. Genuine is 40mm in case diameter, BP version is 40.2mm and 9.7mm thick. BP Nautilus weighs about 131g. 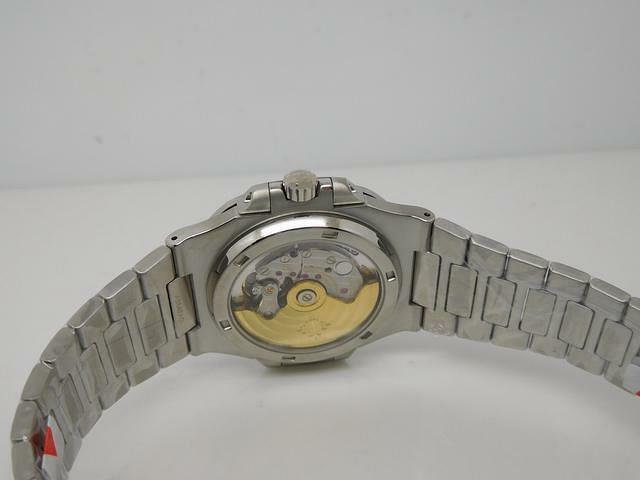 BP Nautilus uses genuine Miyota 9015 movement, while genuine watch uses Cal. 324C. The blue color on dial is very close to genuine although you will find the color difference when compared with a genuine carefully. By the way, a replica can not be manufactured to have the completely same dial color as original, unless you have the authentic color formulation. The stainless steel bracelet of BP Nautilus is superior. Each link is polished well and connects compactly, the gap between bracelet links is relatively larger on Nautilus made by MK or V6, the bracelet polishing also does not look that well on them. The crystal case back completely shows the beautiful movement. BP engraves Patek Philippe Logo on golden rotor, the shock absorber is almost the same as genuine. The axis of auto rotor is fixed by one steel screw. 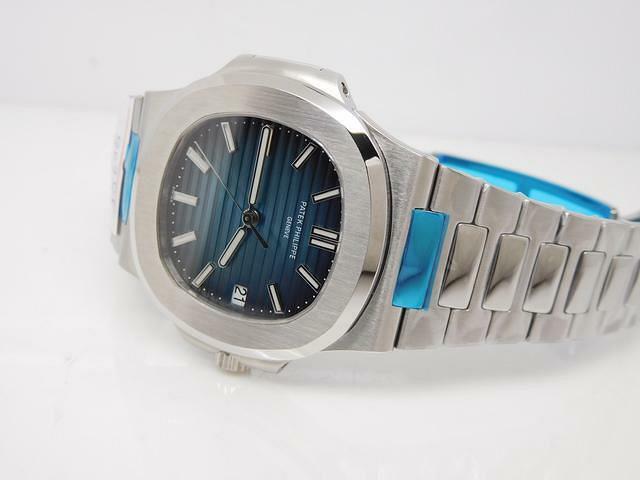 Patek Philippe Nautilus has always been the hot model in replica watch market, with continuous development, the factory accumulated a lot of experience and made several updates to make this replica Nautilus more high end. When holding the replica on hand, its weight is suitable, feel the case by hand, it does not have metal burrs and won’t scratch your wrist. The edge of each bracelet link is polished delicate. Blue dial is very beautiful, under sun light, it will reflect the depth change of the dial. The Nautilus replica made by BP opened a precedent for the outlook imitation, to all replicas, it is a big breakthrough and the best among three Nautilus versions. Hi I like to know the price, how to make order and do payment? What’s the standard warranty ? Interested in this piece… How to contact you for more info? Hi, I have contacted with you through the email, but I did not get a reply from you. Hey guys! How do I order one? Please reply to my email. Interested In this item. Any more info on purchase? Please Karen…How do I order one? Please reply to my email. Hi, I would like to purchase one, please email me. Hey, I would like to purchase one, what is the price? Could you send me information on how / where to buy this watch? Hi, I would like to buy one, please email me. Please email me I need to talk to you about this BP Nautilus. Very excited about it. How can I get one, please? Can I get price and how to place an order? Also delivery time please. I am interested in this BP Nautilus. Can you please send QC pics? I want to buy one now. Do you also have the one with Anthrazit dial instead of blue. Please send me an e-mail with purchasing price and how to purchase the watch. Hi, I want to buy one now. Do you also have the one with Anthrazit dial also. Please send me an e-mail with purchasing price and how and where to purchase the watch. Hi i am interested in it. Pls let me know how n where to buy. Hi, I am interested in this watch. do you still have this model or has a new version come out already? 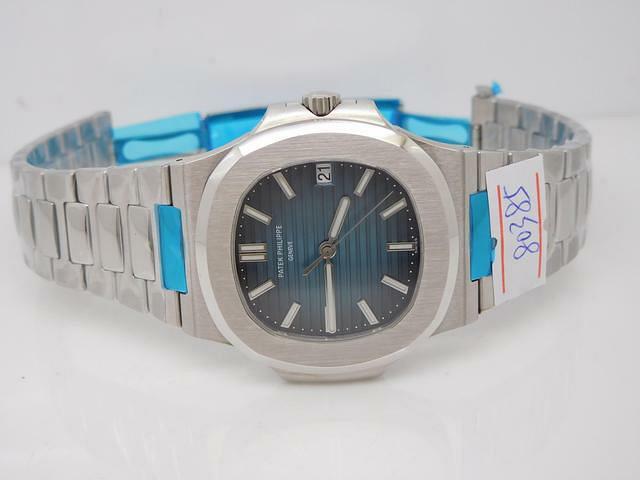 Is there any chance that you could help me with purchasing information regarding the PP Nautilus Jumbo Blue watch with Miyota 9015 movement.